anye Omari West was born on 8 June 1977 in Atlanta, Georgia, United States and a son to Donda West and Ray West. He is an American hip hop recording artist, songwriter, record producer, film director, an entrepreneur and a fashion designer from Chicago, Illinois. After graduating from West Aurora High School, Kanye received a scholarship to Chicago’s American Academy of art in 1997 where he undertook painting classes. He later majored in English at Chicago State University and later at the age of 20 he drop out to concentrate on his dream career, music. His debut was recognized when he released his album the college dropout in the year 2003. Kanye’s other albums include: graduation (2007), my beautiful dark twist (2010) and yeezus (2013). Kanye started dating Alexis Phifer a designer in 2002 and became engaged in August 2006 but ended their engagement in 2008. West then dated model Amber Rose from 2008 until 2010. Thereafter he has been in a relationship with Kim Kardashian since April 2012 of whom they have a daughter, North Nori West and they became engaged in October 2013. 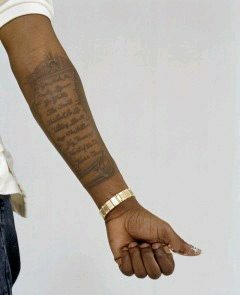 Kanye West is creative and stylish in everything and his dragon tattoo matched by a poem by Maya Angelou stands for that.